The following instructions will guide you through the process of upgrading your SNBX from 32-bit to 64-bit Windows 7 using a USB boot drive and Acronis True Image hard drive image restoration. These instructions can be performed on a separate workstation or on the SNBX with Monitor, Keyboard and Mouse attached. A separate workstation is recommended since the SNBX hard drive will be completely erased during this process. The machine being used to prepare for the upgrade, regardless of whether that is the SNBX or a separate workstation, will be referred to here as “the Workstation” and only the SNBX unit will be referred to as “the SNBX”. This upgrade will cause a complete format of the hard drive and all data on that drive will be lost. Please perform a backup of all data needed including a backup of your current 3CX configuration. Instructions on how to back up your 3CX can be found on 3CX’s website here. Download the following files to the Workstation. Insert USB drive into the Workstation. Once running, it will select the inserted USB drive. If it is not selected, you can select the correct USB drive from the Device dropdown box. Now select the ISO image “NEW_AcronisBootablePEMedia.iso” and then click <Start>. Once RUFUS has completed writing the image, create a new folder on the USB drive (call it SNBX) and copy the Hard Drive image and 3CX installer into that new folder. Insert the USB drive into the SNBX and start or restart the SNBX. Watching the SNBX, as the initial Patton SNBX Splash screen appears, press <F12> and select to boot from the USB drive. After a few seconds, press any key to confirm booting from the USB drive. Wait while Acronis True Image 2015 loads. On the “What would you like to do?” screen, under “Recover”, click “My Disks”. Click <Browse…> to browse to the SNBX folder created in step 6 (on the USB drive under “This PC”) and select the "NEW_x64-windows-snbx.tib" file, click <OK>, then click <Next>. 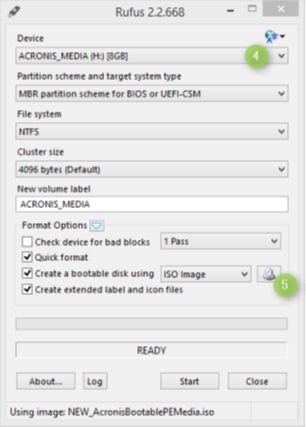 Choose "Recover whole disks and partitions” and click <Next>. Click to place a tick in the "Disk 2" box which will select all items below it then click <Next>. Select the SNBX hard drive (the interface should be Serial ATA) and click <Next>. You’ll be prompted to confirm deletion of all the partitions on the hard drive, click <OK>. On the "Operation Progress" window, check the box for "Restart the computer when the operation is completed"
The Windows 7 64-bit operating system will now be restoring from the supplied Hard Drive Image (TIB file). Once completed, the SNBX will restart and boot to the new operating system automatically. Copy the 3CX installer from the USB drive to the desktop of the restored SNBX. Run the 3CX installer from the SNBX desktop and restore the settings following the instructions from 3CX here. If you have any questions or issues with this upgrade, please contact Patton Technical Support for further assistance.